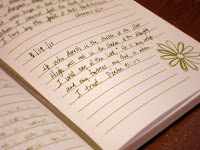 Today's entry, as well as the rest from Janie's journal from here on in, aren't dated by her. If they have a date, it's the daily reading date from the book she was quoting from. Since I don't know the exact date she jotted these things down, I am breaking them up in a way that seems logical to me.